Eddy Davis is a Grammy Winner and has been honored with three Hall of Fame Awards and accepted a fourth for his inspiration the great jazz banjoist Elmer Snowden. He is an Actor, Multi-instrumental Musician, Musical Director, Composer, Conductor and singer. He received his formal training at Purdue University and Chicago University and his musical training at both the Cosmopolitan and Chicago Conservatories of Music. Mr. Davis has appeared on stage at most major concert venues throughout the world including: Opera Houses thru-out Europe, Paris' Olympia Theatre, London's Royal Albert Hall, London's Royal Festival Hall and New York's Lincoln Center and famed Carnegie Hall. Mr. Davis has appeared on many television shows, including NBC's "The Tonight Show". As of May 25, 2006 Eddy was inducted into the American Banjo Museum's Hall of Fame in the category of Promotion. On May 24, 2012 he was inducted into the Jefferson High School Hall of Fame in Lafayette, Indiana. On September the 5th, 2014 Elmer Snowden, an unsung hero of early jazz banjo, was inducted into the American Banjo Museum Hall of Fame. Snowden was a prolific recording artist and band leader who launched the careers of such jazz greats as "Duke" Ellington and "Count" Basie. Eddy accepted the award on his behalf, commenting how much of an impact Snowden's swinging style had upon him as a young banjoist. He demonstrated Snowden's style in a swinging version of "Them There Eyes". On September 11, 2015 Mr. Davis, along with Banjoist/Film Maker Steve Martin and Pete Seeger, was inducted once again into the American Banjo Museum's Hall of Fame this time in the category of Performance. He has performed with a diverse roster of talents that include: Jabbo Smith, Turk Murphy, Georg Brunis, the original Dukes of Dixieland, Tom Waits, Leon Redbone, George Segal, Gene Krupa, Freddie Hubbard, Chick Corea and Benny Goodman. Eddy (on Banjo and Guitar) toured with the National Company of "Hello Dolly", which starred Betty Grable and Ginger Rogers. He then read the musical "Mame" at the Winter Garden Theatre in New York City and joined it's National Company starring Celeste Holme at the Mechanics Theatre in Baltimore. In films he can be seen in the acclaimed Woody Allen documentary "Wild Man Blues", Acting in Mr. Allen’s "Sweet And Low Down", which stared Sean Penn and in Mike Figgis' film "One Night Stand". He can be heard on many soundtracks including "Fried Green Tomatoes" where he is accompanying Patti LaBelle. In his association with filmmaker Woody Allen, Mr. Davis is a music producer as well as Composer of original music for Allen’s films. 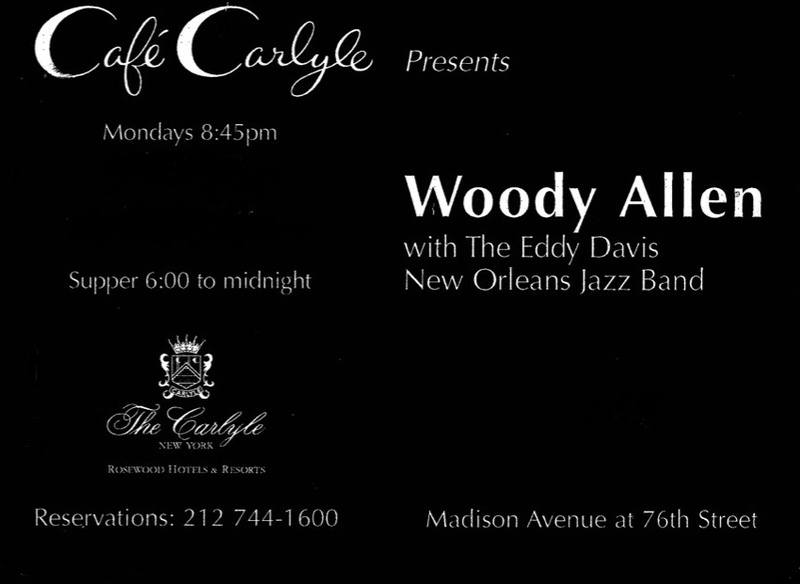 Mr. Davis is also the musical director/leader/banjoist for the "Eddy Davis New Orleans Jazz Band" Featuring Woody Allen on clarinet Which appears Monday evenings at New York City's famed "Upper East Side" supper club The Cafe Carlyle. 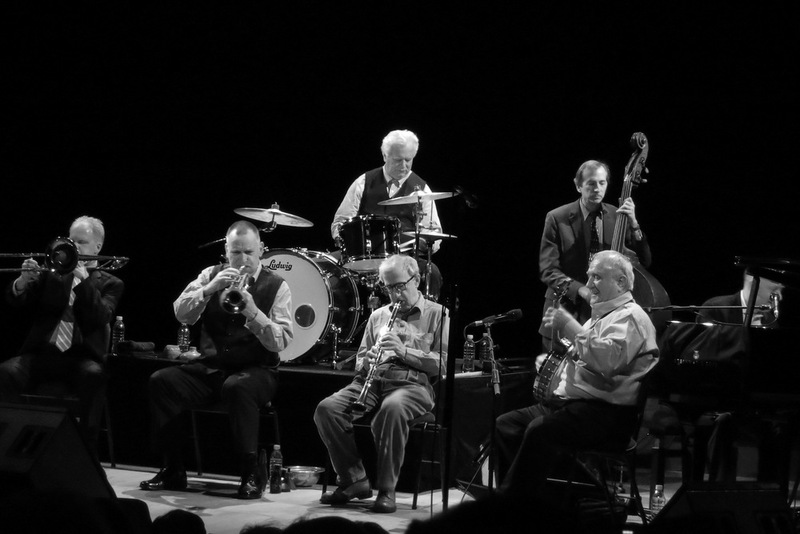 In 1996 the “New Orleans Jazz Band” played a highly successful tour of Europe that Produced a film entitled "Wild Man Blues" starring Davis and the Band. The film won honors at the Sundance and Venice film festivals. The band can be heard on a Music Masters CD entitled "The Bunk Project" and on a CD featuring selections from "Wild Man Blues". After many more European Tours there last one in July of 2017 started with the Royal Albert Hall in London and went to Lisbon, Antibes, Cap Roig Music Festival - Spain, Copenhagen, and ended with two memorable performances at the new Elbphilharmonie Hall in Hamburg, Germany. 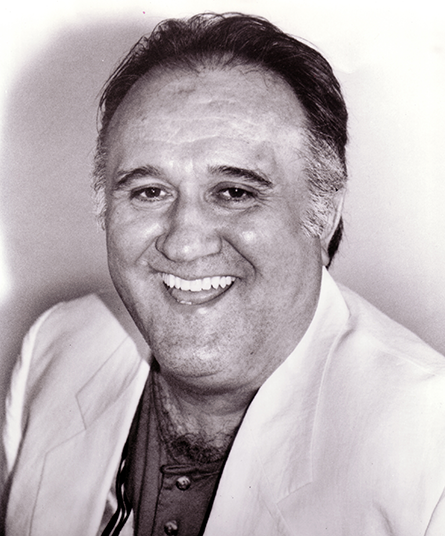 Whether as a creator, producer and/or director, Mr. Davis has been the innovative force behind such projects as: Original music for "The Big Apple Circus"; "The New York Banjo Ensemble"; the "Jazz Leggs" revue at Berlin, Germany's famed vaudeville house The Friedrichstadt Palast; "Ill Music" (The New York Society for the Preservation of Illegitimate Music), most known for their show "The ·Best of Spike Jones"; The "Early Tin Pan Alley Orchestra", a seven piece salon orchestra performing the theatre piece "The Roots and Branches of American Jazz"; two ·seasons of the "New York in Messina festival" of Messina, Sicily; and he was the Musical Conductor/Orchestrater for the Musicals "The Life and Times of Warren G. Harding" and the revival of the 1920's musical "Makin' Whoopee". Eddy has a new show which he and ConalFowkes, Jon-Erik Kellso, Jay Rattman and John Gill performed in the New York Winter Jazz Fest 2018. The show is entitled “The Life and Times of Lil Hardin Armstrong” and is the song writing of Lil — also some stuff she wrote for Louis Armstrong’s “Hot 5”. The show finishes with “Just For A Thrill”, which was a big hit by Peggy Lee and Ray Charles. As of the last several years Eddy has settled into his writing. He composes book, music and lyrics for theater, string quartets and orchestral works. On occasion he sings his original songs in live performance. In 2016 his song "Play The Bossa Nova" was featured in the Independent Film "Victor Goodview". In Woody Allen's film "You Will Meet A Tall Dark Stranger" Eddy has a trio with Conal Fowkes on bass and Woody Allen on clarinet. On February the 10th, 2013 Mr. Davis won a Grammy for music production and arranging for Mr. Allen’s Soundtrack Album "Midnight In Paris". © 2018, THE EDDY DAVIS. All Rights Reserved.